Mission Bay Aquatic Center Blog: Tweet #igotcredit to win! 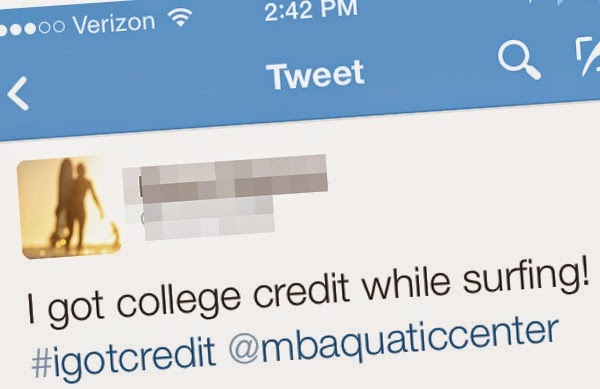 Let the world know you got credit for watersports with #igotcredit for a chance to win a free credit class this fall semester! If you’ve ever taken one of our ENS watersport classes for college credit, then you know that this is the best class to take for a unit. We would love your help spreading the word about these amazing classes, so drop a line on Twitter with hastag #igotcredit and you will be entered to win a semester-long ENS class this fall. Even if you’ve graduated from college, no one can pass up 15 weeks of wakeboarding, surfing, or kayaking for FREE. These classes are open to everyone, with lucky college students getting a grade for learning to surf, sail, or stand up paddleboard. Tweet #igotcredit for your chance to win!